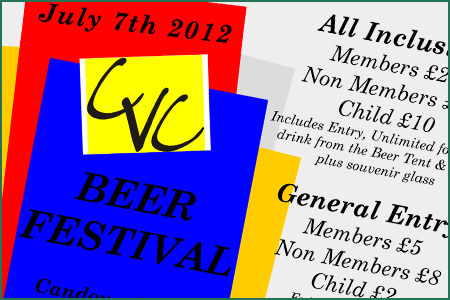 The Candover Valley Club presents its annual Beer Festival this July. Featuring a wide range of beers and ales, a barbecue, live music and a bouncy slide, this event is fun for all the family. All-inclusive : Members £29, Non-members £39, Children £10 — includes unlimited food & drink, and a souvenir glass. Members Special Family All-inclusive : Members £58 for 2 adults and 2 children — includes unlimited food & drink, and souvenir glasses. General Entry : Members £5, Non-members £8, Children £2 — includes one free drink and a souvenir glass. For tickets and information please contact Cat on 01256 389352 or email catlskilton@gmail.com.